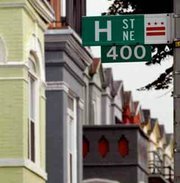 Rising from the ashes of beloved and reviled Toyland comes The Big Board, a new gourmet burger joint and bar at the corner of 5th and H St NE. The decor is noticeably different from the Toyland days. The owners have smartly chosen an understated yet considerably more urban theme, with exposed brick and a clever array of park benches serving as the window seats. The ground beef braintrust consists of former chefs from Granville Moore and The Queen Vic, and I must say, the burgers are delectable. Choose from roughly ten specialty burgers or make your own — there’s an array of sauces (including a mouth-watering red pepper aioli) and an assortment of toppings. Celiacs rejoice – they even have gluten free buns. Baller. The bar has a neat concept — they have an array of beers each night that appear on a faux-stock ticker screen, and every few minutes one or two of these beers will go on special — 50-75 cents off each pint. A breath of fresh air for the gimmicky-laden corridor. The owners are very friendly and approachable and seem to really want this place to be the best neighborhood bar it can be. It’s not quite the Queen Vic, but they’re sure off to a good start. Check it out.